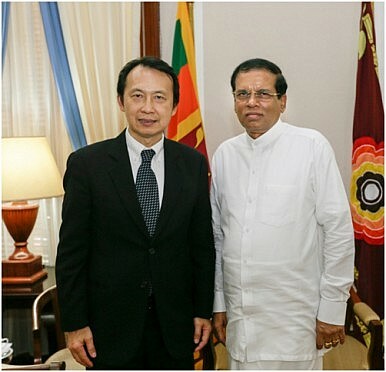 Sri Lankan president Maithripala Sirisena pictured here with Thailand's ambassador to Sri Lanka. Another senior U.S. government official showers Sri Lanka’s new government with praise. There was another high-level U.S. visit to Sri Lanka this week. State Department Counselor Thomas Shannon visited the island nation from December 14-16. The highlight of his trip seems to have been the formal announcement that the first “U.S.-Sri Lanka Partnership Dialogue” will be held in Washington this February. The dialogue will focus on four broad areas: governance, development cooperation, and people-to-people ties; both economic and security cooperation; and global and regional affairs. In his December 16 speech, Shannon made a fleeting reference to accountability for wartime abuses and the recently passed UN Human Rights Council resolution on Sri Lanka. Yet, quite clearly, the focus of his trip was elsewhere. With each passing month, U.S. support for Sri Lanka appears to be getting stronger and the prospects of the Barack Obama administration applying more sustained diplomatic pressure on Colombo (regarding accountability for wartime abuses, ongoing human rights abuses, and other difficult, unresolved subjects) looks increasingly unlikely. Indeed, this slobbering love affair seems be in full swing. The possibility of Obama visiting Sri Lanka has been on the table for some time and Shannon’s visit would suggest that the president certainly hasn’t ruled out such a trip. Given the way U.S.-Sri Lanka ties have been evolving, one could even imagine Obama visiting both Myanmar and Sri Lanka next year, perhaps even on the same trip – talking human rights, improved governance and successful democracy promotion efforts. We’d likely hear about “historic moments” and U.S. “engagement.” We’d probably be reminded of the importance of trade, aid, and free elections, while linking it all to America’s pivot to Asia. An outgoing U.S. president, quite conveniently, would have a pair of foreign affairs success stories; those seem to be in short supply these days. Samantha Power Misses the Mark on Sri Lanka (Again)The US Must Pay More Attention to Sri Lanka’s Transitional Justice DebateSri Lanka’s Circuitous Road to ReformStart of a US-Sri Lanka 'Reset'?What Does Regime Change in Sri Lanka Mean for the United States?